I fully intend to wear my wedding dress again (on every anniversary while I sit on my couch and eat chocolate and drink champagne), but I have toyed with the idea of selling it. Every time I want new furniture for the house I think, "Ok. Now realistically, am I ever going to fit in this thing again?" 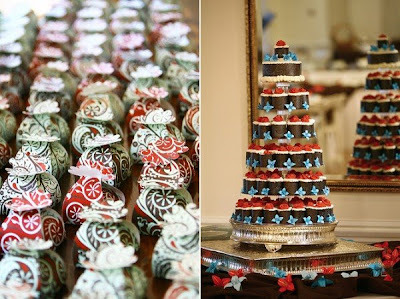 I keep it as motivation to stay at my wedding weight (though it's nine months later and clearly that logic didn't work). I don't have any grandiose ideas of one day having a daughter who wears my dress. If I have a daughter and if she chooses to get hitched one day, I want her to have the thrilling experience of picking out her own dream dress. This is where Once Wed comes into play. 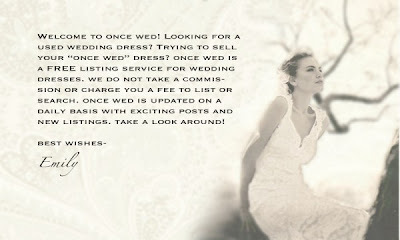 It's a beautifully-designed site for brides to sell their previously - and new! - worn wedding dresses. Hint: Once Wed is also a great way to find out what designer gowns really cost. Look for the details on what the brides originally paid for their gowns. UPDATE: Do you love these photos too? Well then, check out Thryn and Gabe's Flickr set for images of the entire wedding. There are a ton! Also, visit Thryn's blog for fantastic eco-friendly finds. Thanks for the shout out! Your blog is great! Chere--that site is gorgeous! I'm going to link to your blog post today, and also the oncewed's site. Great find--there are some things that I find out TOO late about! Thanks, doll! Did you keep your dress?